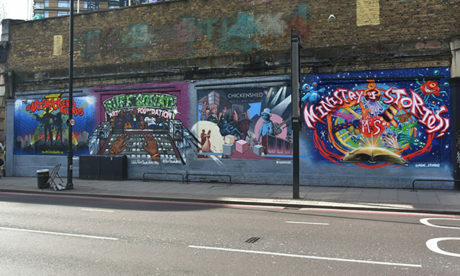 A businessman who ran the iconic Shoreditch Art Wall until last year has announced plans to sue its new owners after he claims they “broke a legal arrangement” that would allow him to continue running it. Peter Mackeonis, who founded the art wall in 2011, today launched a CrowdJustice appeal to raise funds for a legal fight with Cain International, the consortium behind £750 million-pound development The Stage. Mackeonis says he “had been operating the wall as an advertising business for 13 months on the understanding that I had a three-year agreement in place with Cain International, before they gave the wall to another company to run”. The future of the wall had been in some doubt before Cain International and Mayor of Hackney Philip Glanville announced in March 2018 that it would be preserved as a space for artists and charities – to be run by local agency Global Street Art. This news came as a surprise to Mackeonis, who said: “At first, when Cain International began the Stage development, they encouraged me to continue renting out the wall because it deterred graffiti, and the high-end art and advertising enhanced their luxury development and construction site. 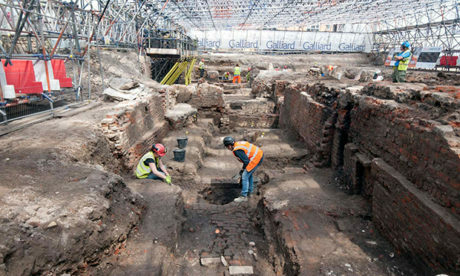 Archeologists excavate the site of the Elizabethan Curtain Theatre, remains of which will be preserved at The Stage. A spokesperson for The Stage told the Citizen that the decision to hand over the running of the wall to Global Street Art was done “by the book”. They would not be drawn on the circumstances surrounding the changeover, which Mackeonis claims resulted in a Gucci advert being ripped off the wall and dumped in a nearby bin. After what he describes as failed attempts to reach a “fair solution” with the developers, Mackeonis is now preparing for a “David versus Goliath” battle for damages. If he fails to reach his £10,000 crowdfunding target by 2 March, those who have pledged their support will not be charged. Mackeonis, currently based in the US but whose “family have had close ties to the East End for over 100 years”, says he has been advised that he has a case. He told the Citizen: “Because [the developers] did not stop me from using the wall for my business, and in fact were cooperative, under the principle of estoppel, this meant that we had their permission to use the wall and that they had accepted my three-year agreement as offered. A law firm acting on behalf of the developers, in a letter dated July 2018, rejects Mackeonis’ claims, saying “there is no basis whatsoever, in contract or otherwise, for any claims against our clients”, and that “any court proceedings will be defended”. The Stage spokesperson said: “The Shoreditch Art Wall is being managed in accordance with, and adhering to specific legal procedures. The Stage, which will include housing, office and retail space, is set to open next year. Construction was put on hold in 2016 to allow a team of archaeologists to excavate a recently unearthed Elizabethan playhouse, the remains of which are to be preserved in situ.